XpertMart™ will run equally well on either the Windows™ or Mac™ OS X operating systems. For this reason you can also run XpertMart ™ on a network consisting of a mixture of Mac ™s and PCs. Currently XpertMart™ is tested to run on any of the following databases: Interbase™, Firebird ™ (Firebird is a "branch" off of the original Interbase open source database), Oracle™, PostgreSQL ™ and MySQL™. As shipped, XpertMart ™ runs on Interbase™ on Windows ™ and Firebird™ on Mac ™ OS X. These instructions tell you how to configure for either Interbase ™ or Firebird™. When you run XpertMart™ on a network you install the database server on only one of the machines. All the machines use the same database server. On a mixed Windows™ and Mac™ OS X network you would either install Interbase™ on a Windows™ machine or Firebird ™ on a Mac™ OS X machin e.
All XpertMart™ needs to know to run on any kind of network is where the database server and database are located. Only the entry titled "Database" changes from one machine to other on the network and from Windows™ to OS X. 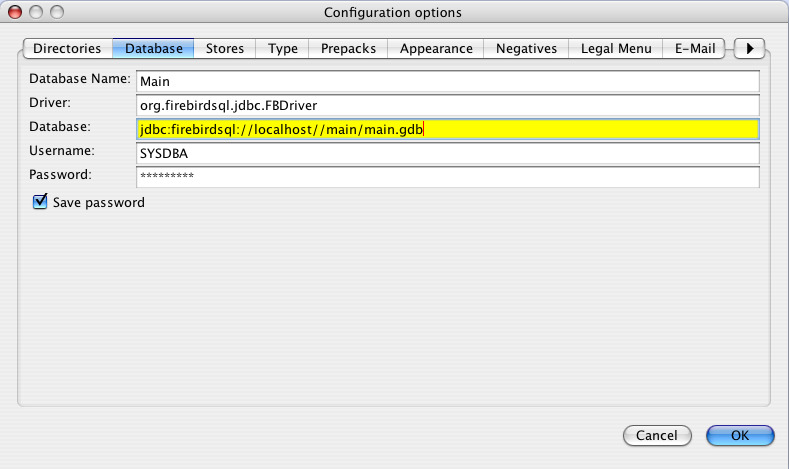 The text "jdbc:firebirdsql:" refers to the JDBC interface to the database. You use the same text both for Interbase™ and Firebird™ database servers. The text "//localhost/" refers to the machine which hosts or has the database server installed. (The name localhost is interpreted to mean that the database is on the same machine.) You can put the IP address of the machine here as in "//192.168.0.34" or the name the machine has on the network such as "//officecomputer/". The important thing is that the machine which has XpertMart ™ installed can "see" the machine that hosts the database server. This can be tested via the Ping command in either a command (Windows ™) or terminal (Mac™ OS X) window. Examples of this are: "ping localhost", "ping 192.168.0.34" or "ping officecomputer". If the Ping command says it cannot find the specified computer or address then XpertMart™ will not be able to find it either. If the Ping command finds computer on the network then XpertMart™ will also find it. NOTE: Interbase™ and Firebird ™ use ports 3050 and 3060 to receive and send information from and to the database. Make sure your firewall does not block these ports so that XpertMart™ can work with the database server. The text "C:/Main/Main.gdb" specifies the location of the file on the host machine that contains the database. On a host Windows™ machine it would begin with the driver letter, on a host Mac ™ OS X machine it would begin with the file root as in this example: "/Main/Main.gdb". It is important to note that you specifiy the file which has the database on the host machine, not on the machine running XpertMart ™. So even though you are running XpertMart ™ on a Mac™ if the database server is on a Windows™ machine then you have to specify the drive letter as in: "C:/Main/Main.gdb". Likewise if you are running XpertMart™ on a PC but the database server is hosted on an Mac™ OS X machine then you do not specify the drive letter as in: "/Main/Main.gdb".